I believe that to be the very best at Fantasy Baseball you need to understand where teams are coming from with the moves they make. This doesn't mean you need to agree with every move but rather be able to see what the general manager was thinking. For this reason, I try to know as much as possible about the GM of each MLB team. Jerry Dipoto seems to be one of the better young minds running a baseball team. It began in July 2010, when he took over as interim general manager in Arizona upon Josh Byrnes' dismissal, then eased the D-backs' payroll, restocked their barren farm system and put them on the path to an eventual playoff berth with the savvy trades of Edwin Jackson, Chris Snyder and Dan Haren (now the Angels' No. 2 starter). 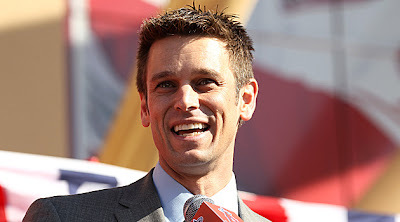 It happened through two interviews with Angels owner Arte Moreno and president John Carpino, who met Dipoto over breakfast and dinner in Arizona and ultimately chose him over a wide-ranging list of candidates. And it happened on a grease board at his Winter Meetings suite, where it took Dipoto only 20 minutes to impress even the saltiest of scouts. "Some of the guys that had been around for a while came out of there just in awe saying, 'Man, that's unbelievable,' and, 'We're in such good hands,' said Tim Schmidt, who worked for Dipoto in Arizona and is now one of his special-assignment scouts. "I look at them and say, 'Oh geez, guys, he's just getting started. He's got a lot more than that.'" He had plenty more in the January organizational meetings he set up at the club's Spring Training site in Tempe, Ariz. Scott Servais, one of Dipoto's new assistant general managers, was in charge of putting together the agenda and needed to fill three hours. He figured Dipoto would take up one of them, so Servais was looking for somebody to open and close the day-one session. No need. Dipoto took up the entire time breaking down his philosophies for constructing a 25- and 40-man roster.